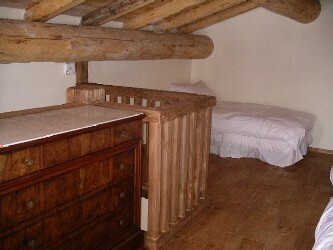 Bedroom 4: Chalet Charmes Standard Mezzanine Room without bathroom: Loft style with three single beds (two can be joined to make super king-size bed) with unspoilt west facing views across the valley. This room has no bathroom, so would suit children with parents or friends in rooms 2 or 3. Restricted headroom in some areas. (Overall area 19m²).